My name is Angel and I’m a software engineer with more than 7 years of experience who love to work with new technologies. I have been working as fullstack developer in different projects using different architectures, languages and frameworks. My main focus last years has been blockchain so i have a good knowledge of different platforms and a vast experience building dapps and toolings on them. @NulsIoBot telegram that allows to watch a node credit receiving notifications about yellow and red cards, credit up and down, new and lost stakers, and more features that will come soon. Shared rewards calculator webapp to help node owner who has shared nodes to calculate the reward of their stakers fast and easy. Here is my progress report thread where you can find details of the work i have done for NULS since i started working as a CCC member. As a part time developer for CCC, I am receiving a little around 1,653 NULS per month, considering 40% tax rate in Spain plus 8-9% bank fees then the net amount comes to 843 NULS per month, and this is not considering that the amount of NULS staked tend to increase of time which will further decrease the monthly NULS rewards. 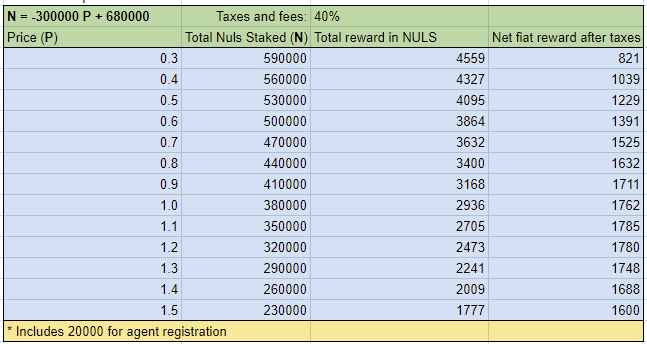 At today’s market value NULS is priced at $0.36, this results in my developers monthly salary being $595 before tax, and $306 after tax. This proposal is to request your vote (after a 7 days discussion on it) to support the staked amount increase in my node. Again, the amount staked belongs to the community, but allows my node to earn more rewards to help compensate me for my half-time work. Let's keep on working hard in NULS! !